The first week of December 2018 shall forever be known as the week Marvel fans couldn't catch their breath. On Monday, December 3, Marvel unleashed the second trailer for Captain Marvel — which feautred a cuddly cat, an alien space battle, and a declaration from a mystery character that cleared up a potential Avengers 4 plot hole. The studio is expected to launch the first footage from Avengers 4 on Friday, December 7, and just a day later, Sony is scheduled to drop the first trailer for Spider-Man: Far From Home on Saturday, December 8 during Brazil Comic-Con. Collider announced the trailer release date on Tuesday, December 4, citing trusted sources that have indicated fans will get the first peek at Tom Holland's Spider-Man swinging through the skies during the Sony Panel at Comic-Con Experience in San Paulo, Brazil. Following the initial report, IGN corroborated the claim, confirming that the Far From Home trailer is indeed coming this weekend. 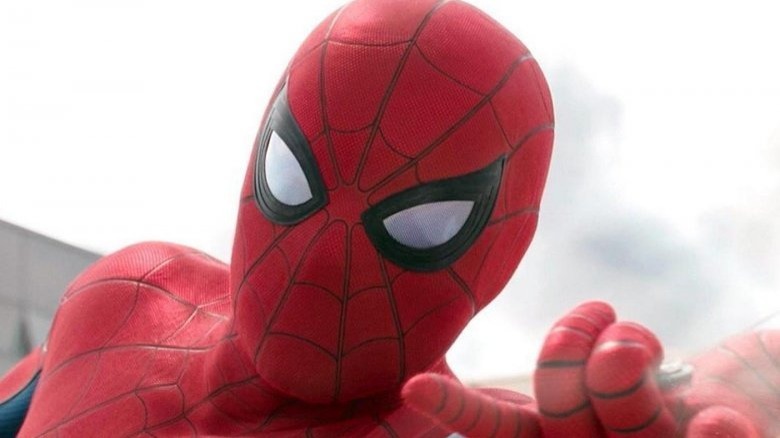 As trailer reveals during conventions tend to go, it's assumed that the Far From Home footage will make its way online shortly after it screens during Sony's presentation — assuming that sneaky, rule-breaking attendees don't record the trailer and post it to social media themselves before studio Sony has a chance to do so. The fact that a Spider-Man: Far From Home is headed our way in just a few days is plenty exciting on its own, but it's even more intriguing when remembering that Holland's Spidey is, as of this writing, dead in the Marvel Cinematic Universe canon. Poor Peter Parker disintegrated at the end of Avengers: Infinity War, leaving everyone to wonder how Marvel will address the character's history in Far From Home. Of course, Spidey won't be dead in the film, a sequel to 2017's smash hit Spider-Man: Homecoming that's set after the events of Infinity War and Avengers 4, because that just wouldn't make a single ounce of sense. But there's no telling how Avengers 4 directors Joe and Anthony Russo intend to bring the web-flinging hero back from the dead, or how Far From Home helmer Jon Watts will explain what happened to Spidey in the time between Homecoming and his globe-trotting adventures in the upcoming sequel. In addition to showing a very-much-alive Peter Parker, the first Spider-Man: Far From Home trailer might also offer a glimpse at returning stars Marisa Tomei as Aunt May, Zendaya as Michelle (a.k.a. "MJ"), and Jacob Batalon as Peter's best bud Ned, as well as Jake Gyllenhaal as the evil Mysterio and Samuel L. Jackson and Cobie Smulders as Nick Fury and Maria Hill — who will, like Spider-Man himself, be revived after perishing in Infinity War. Spider-Man: Far From Home is set for release on July 5, 2019.